Mountain Echo Dulcimer Troupe will provide a concert of holiday music to get us in the spirit to celebrate! The plucked dulcimer has been known by many names: Appalachian dulcimer, lap dulcimer, mountain dulcimer, Kentucky dulcimer. Local variant names include "delcumer," "dulcymore," "harmonium," "hog fiddle," "music box," and "harmony box.". The instrument is essentially a fretted zither traditional to the southern Appalachian mountains of the eastern United States consisting of a narrow fingerboard attached to a larger soundbox underneath. 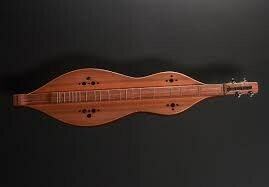 Never widespread and found only in scattered pockets of tradition, the dulcimer since the 1950s has gained popularity outside the mountains and is today widely used by both amateur and professional musicians for primarily folk-based repertoires.